SAN FRANCISCO — For many wine lovers, California Wine Month in September is the best time of year to visit wine country when the vineyards and wineries are creating their next great vintage and celebrating with dozens of special events and activities. This September, wine-loving consumers will flock to wineries and festivals across the state to see their favorite winemakers and get in on the harvest action themselves. From picking and crushing grapes to events, VIP tours, tastings and concerts, vintners in many of California’s 116 diverse winegrowing regions offer ways for people—from beginners to experts—to enjoy the state’s signature beverage. 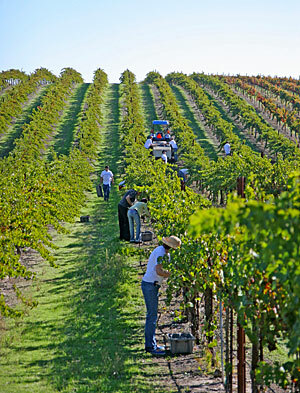 For full details on the activities, go to: www.discovercaliforniawines.com / californiawinemonth. "Governor Brown proclaims California Wine Month in September to recognize how much the wine industry contributes to our state’s economy, culture and lifestyle. With so many celebrations and events taking place, and all the action of the annual harvest, it’s the perfect time to visit,” said Robert P. (Bobby) Koch, president and CEO of Wine Institute, which created California Wine Month nine years ago. "As the leading wine and food destination in the U.S., producing 90 percent of our nation's wine and over 40 percent of its fruits and vegetables, California offers excellent wines and fresh, creative cuisine to go with them. Following are just a few of the exciting events and activities in September. For a complete regional listing of the more than 70 California winery events in September, click here. No time to put the top down and visit the wine trails? No problem! Take a California Wines Road Trip in one stop on Sept. 21 at Wine Institute’s official California Wine Month celebration at San Francisco’s Ferry Building. Guests can taste more than 100 California wines from 12 regions with artisanal cheeses and salumi. Attendees can also enter to win one of several trips for two to California wine country. Sailing and wine enthusiasts can pair their favorite pastimes at the Napa Valley Wine Lounge at America’s Cup Race Park September 7-21, sampling Napa Valley wines by the glass and light bites as they watch the races from Piers 27/29 in San Francisco. A great way to relax this Labor Day weekend, August 31–Sept. 1, is the Sonoma Wine Country Weekend, named one of the 10 Best Wine & Food Events in the U.S. (Celebrated Living). This event will feature 200-plus wineries and chefs showcasing their talents at Taste of Sonoma at MacMurray Ranch, as well as a wine auction at Chateau St. Jean, seminars, cooking demonstrations, vineyard tours, dinner and dancing at Francis Ford Coppola Winery and multiple winery parties. The events benefit more than 30 Sonoma County charities that help students, children, farm workers and people in need. Up in redwood country, Mendocino's Wine Song 2013 Charity Auction & Tasting begins with the Anderson Valley Pinot Noir Celebration on Sept. 6—a chance to savor the offerings of 25 wineries paired with culinary delights, as well as opportunities to mingle with winemakers. On Sept. 7 the Winesong Food & Wine Tasting offers guests the Mendocino Coast Botanical Gardens setting paired with regional vintages, as well as 50 Mendocino County food purveyors and nine diverse music groups. That same day is the Wine Song Charity Auction, featuring the chance to bid on incredible trips, wine, art and food— all benefiting local health services. Lodi wine country rolls out the red carpet from Sept. 1–30 for its second annual LoCA Road Trip Passport, offering an all-access pass to exclusive events and discounts from over 45 participating wineries. Passport holders can enjoy activities such as cycling excursions, vineyard tours, barrel tastings, bottling demonstrations, grape stomps, wine and cheese pairing classes, live music, winemaker dinners and more. The Madera Vintners Association’s California Wine Month Tasting Reception will feature 10 regional wineries offering tastings, plus music and bites from local restaurants on Sept. 26. Wine and food lovers can step into the pages of Sunset magazine and savor the California Central Coast wine country lifestyle Sept. 26-29 at Sunset SAVOR the Central Coast, featuring four days of culinary immersion in San Luis Obispo County, including culinary and outdoor adventure tours, wine and food celebrity seminars, more than 200 regional wine tastings, and evening events at Hearst Castle, Pismo Beach and at Vina Robles winery in Paso Robles. Nearby in the Paso Robles wine region, wine lovers can enjoy the 46 West Wineries Summer Block Party on Sept. 7 in Templeton, a mini-wine festival with tastings from 16 wineries along with great food and music. Uncork the Story in Santa Barbara's Santa Ynez Valley will take place throughout the month, where various wineries are offering fun events, classes, winemaker dinners, tastings and special wine and hotel packages. On Labor Day weekend is Livermore’s 32nd Annual Harvest Wine Celebration, where wine lovers can take complimentary shuttle buses to more than 40 Livermore Valley wineries sharing their finest wines, and take in local music, art and food. In the Santa Cruz Mountains, eco-enthusiasts can learn about organic and sustainable winegrowing practices at special tastings, picnics and tours at the Organic Wine Trail of the Santa Cruz Mountains during several weekends in September (Sept. 7-28). Over in Carmel Valley, the SAVOR East End Wine Row Passport is a great ticket to special tastings and souvenir glasses at various wineries throughout September. Heading to Gold Country during the beautiful fall days? Check out the First Annual Downtown Wine Tasting in the Streets in Amador on Sept. 27, featuring tastings from 15 wineries, paired with artisan cheeses and bread, commemorative crystal wine glass and live music. Those looking to savor their last long summer weekend in South Lake Tahoe will want to visit the 4th Annual Sample the Sierra Festival on Sept. 1, a farm-to-fork event celebrating some of the best art, wine and food of the Sierra Nevada. The festival pairs local farmers with chefs who produce delicious tastings, which are then paired with the appropriate regional wines. Other activities include farm tours, winemaker dinners, live entertainment and art— all culminating with a fireworks extravaganza over Lake Tahoe. Over on the north side is the 28th Annual Lake Tahoe Autumn Food & Wine Festival Sept. 6-8, featuring grape stomps, wine and food pairings, celebrity chefs, wine seminars, cooking demos, Blazing Pans Mountain Chef Cook-Off, kids cooking classes, wine & brew walk, gourmet marketplace, culinary competition and grand tasting, farm-to-table dinner, winemaker dinners, vertical tastings and live entertainment. Enjoy California wines at CRUSH: Temecula Valley 4th Annual Wine & Culinary Showcase, a multi-winery harvest festival with wine, food and live music on Sept.14. You can also purchase a SIP Temecula passport, which offers savings at your choice of four out of 35 wineries anytime during the month of September. At Paramount Pictures Studios on Labor Day Weekend August 30-Sept. 1, wine lovers can experience the Los Angeles Times The Taste 2013, where top wineries, restaurants and other purveyors share samplings of great wine and food. Just after that on Sept. 4, taste more than 30 regional wines, plus gourmet cheese and chocolates at SummerTASTE Downtown LA. Further south in San Diego County is the 3rd Annual Rancho Bernardo Historical Society Tasting Festival on Sept. 22, where local wines, beer, food, art and music converge. National: Safeway/VONs, Amtrak, California Pizza Kitchen, Vino Volo, Kimpton Hotels & Restaurants, Fleming’s Steakhouse and Tavistock Restaurant Group. California: Bankers Hill Bar & Restaurant (San Diego), California Restaurant Association (California), Carneros Bistro & Wine Bar (Sonoma), Farmhouse Inn (Russian River Valley), Ferry Plaza Wine Merchant (San Francisco), Giordano Brothers (San Francisco), Hock’s Farm (Sacramento), Lark Creek Restaurant Group (San Francisco Bay Area), Marina Kitchen (San Diego), Wood Ranch BBQ & Grill (Southern California) and Visit California. International: Wassy’s (Japan), Butlers Wine Cellar (UK), General Wine Company, (UK), Secret Cellar (UK), Aitken Wines (UK), Aged in Oak Wine Company (UK), Cambridge Wine Merchants and The Cheese and Wine Company (UK). New York: 67 Wine, Astor Wines & Spirits, BottleRocket Wine & Spirit, California Wine Merchants, Chelsea Wine Vault, Flatiron Wines & Spirits, Honor Wines, Slope Cellars and Smith & Vine. To learn more about California wine country, go to www.discovercaliforniawines.com for more information on wine regions, wines and winery amenities to plan your trip. Established in 1934, Wine Institute is the association of nearly 1,000 California wineries and wine-related businesses that initiate and advocate state, federal and international public policy to enhance the environment for the responsible production, consumption and enjoyment of wine. For more information, see www.wineinstitute.org.